Federal officials say the Federal Emergency Management Agency will distribute a loan once Puerto Rico's cash balance decreases. 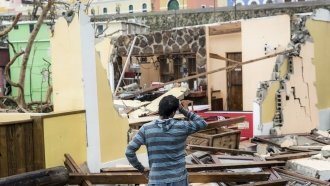 Almost four months after Hurricane Maria made landfall, Puerto Rico recovery still has a ways to go. Now, the federal government is telling the U.S. territory it can't receive community disaster loans yet because it has too much cash. In October, Congress allowed up to almost $5 billion to be transferred to the Federal Emergency Management Agency's Community Disaster Loans Program. Those loans were to go to local governments in areas hit by hurricanes Harvey, Irma or Maria. In a letter dated Jan. 9, officials from FEMA and the Treasury Department said despite Puerto Rico predicting it would run out of funds around the end of October, it actually recorded $1.7 billion in available cash just before the start of 2018. Federal officials also pointed out the Puerto Rican government revealed it had almost $7 billion in hundreds of bank accounts as of the end of November. Some of that money couldn't be used for hurricane relief efforts because it had already been set aside for specific purposes. But, because of the money Puerto Rico does have, FEMA and the Treasury Department say they're going to hold off on giving the territory its allotted community disaster loan until its "central cash balance decreases to a certain level." The officials didn't say what that level is exactly. The federal government is going to allow Puerto Rico's 78 municipalities to apply separately for loans, though. As of Thursday morning, about 17 percent of Puerto Rico Electric Power Authority customers were still without electricity, and some residents were still without water.